Working here in San Lorenzo takes me to a level of health care delivery that is quite challenging and faith-stretching. We frequently encounter situations that are involve risky and difficult surgery in the face of very limited resources and support. Jane and I are there by ourselves. We work as a team but we always have a third person at the table, our chief consultant, the Lord Himself assisting and guiding us. We ask Him to literally wrap His hands around ours as we work together to accomplish the surgery and bring healing to the patient. Being Jesus to our patients requires faith on our part. We take up the corners of the stretcher and carry the person to Jesus. How often do we depend on the faith of our friends? If you were on a stretcher right now, who would come and grab a corner to carry you? Do you have four loyal friends who would drop everything to carry you to get help? In this story these four friends carried this paralytic to Jesus to bring healing to him. They were convinced that their friend would be healed if only they could bring him to Jesus and allow Jesus to touch him. Look at the effort they went to to accomplish this goal. The journey would not have been easy. The stretcher was a mat; it had no wheels. These four men had to carry this man and we have no idea how far they had to walk. Then they come to the house where Jesus was teaching and could not even get close to the door because of the press of the people. That would be enough of a barrier to turn many away. Yet, these men thought of a way to work around all these people. They went up on the roof and punched a hole in the roof to lower their friend to Jesus. Imagine the effort to work through the people and carry this man, without dropping him or having him slide off the mat, up some stairs or a ladder to get on the roof. Then they had to pull apart the structure of the roof to gain entry into the room below where Jesus was. They had just their hands as tools. The roof was likely hardened mud or clay. It could have been thatch but that would mean a roof that was peaked and not flat like the typical roof of the houses of that community. Digging through the roof would have generated a lot of stuff falling down into the room below. Imagine the dirt falling onto and around Jesus and the people as they were there listening to Him. Imagine the distraction and confusion this would have caused. Yet these men persisted and were able to create an opening large enough to be able to lower their friend down to the floor at the feet of Jesus. Then the job of lowering the man would mean each man above would have to lay down to gain full length of their arms to be able to lower their paralytic friend without dumping him on the floor. Possibly they had to tie something on each corner to be able to gain enough length to allow their friend to slowly and gently settle on the floor. At any rate they succeeded in bringing their friend to the feet of Jesus. Jesus’ first response to this man landing in front of Him was to look up. Of course, with all the commotion above and the dust and debris falling down, you would naturally look up. Probably several in the room were indignant about the interruption. Possibly the owner of the house was agast watching his house being torn apart. But Jesus was looking at something different. He looked into the eyes and hearts of the four friends who brought this man to him and saw their faith. This spurred Jesus to bring healing to this man. What grabs me about this story is the value of the faith of our friends when we are on the mat needing help and also when we grab a corner and carry a friend to obtain healing. Have you considered how your faith may impact a friend’s life? How has the faith of our surgical team made a difference in the lives of our patients? Certainly, treating a disease, removing a tumor, correcting the anatomy so function is restored makes an impact and it is a great thrill for us to see a person healed. But what about that person’s walk with Christ? The paralytic was not only forgiven but healed physically. He got up, picked up his bed, and walked out of the house. Not only do we have the opportunity to apply our medical and surgical training to help someone, we pray for these patients and especially pray for their relationship with God. The greatest thrill is to see a life changed with a relationship developed with God, so see someone receive spiritual healing. Today, as is every day. is a day to exercise our faith for our friends. Be a stretcher bearer in someone’s life today. Someday you will be on the stretcher and the worst part about that is if there are no hands to grab a corner except yours. Father, as I read the Scripture in Mark about this man being brought to Jesus by his friends, I think of the people, the friends, you have brought into my life. I am privileged and very grateful I have people’s names, friends and family, written at all four corners of my stretcher. When I am in need, You have already supplied those who would exercise their faith in You on my behalf. Lord, I praise You for this. My heart is filled with thanks for Your unfailing love for me. Actually, Your unfailing love is available to anyone. Lord, I can’t imagine a heart that big that all You have is love for every man whether that person accepts that love or rejects it. Thank You, Lord Jesus, for exercising that incredible love by taking our sins and nailing them to the cross, for suffering a horrible death to cover the penalty I owe for my sin, for freeing me from eternal condemnation and giving to me instead eternal life in Your presence. Oh Lord, I am overwhelmed with thanksgiving right now. Help me, help us be friends today, friends that will exercise our faith to bring someone to Jesus, to even be Jesus to them today. Thank You, Lord. Amen. The night was a little more restless because of the outside noise. Not only was there a lot of noisy truck traffic but also in the neighborhood someone had very loud music playing into the wee hours of the morning. At times I heard people singing and shouting. I wonder if some local bar was in operation with patrons getting juiced up and louder as they became more saturated with what they were drinking. At any rate, it did not mix well with sleep and we have no windows to close. The windows are covered with screen only so there was no way to shut out the noise. Then the mosquitoes did their touch and go practice as well on my face and arms. It was too hot to cover up but had to in order to keep the mosquitoes from landing and feasting. Upon arising I was able to be refreshed with a shower and then we fixed some oatmeal for the three of us before going to the clinic or the tile installation site. Jordan and Howard will work on the tile today and probably will get a good section of the room remaining tiled. They will probably have the entire lower floor tiled by tomorrow. Then they will start on the walls. The upstairs work is not complete yet as that crew is there putting up the cement block walls. There is no way any tile could be put down there until all the blocks, scaffolding and tools are removed and the floor cleaned. I don’t know if the second floor will be able to be done this time. I met with Jane and the clinic staff in a little room where we meet to have devotions before starting the day. This room is in the older part of the clinic and has no windows and no ventilation. It was very warm and we all were fanning ourselves. I thought it was ironic that sitting against the wall were two air conditioning units still in their boxes. I wished one of them was installed and operating. Today Jane and I have four small surgeries under local anesthesia. This is what we call “lump and bump” surgery, removal of moles or other bumps that the patient finds and wants removed. Later this afternoon we hope to take Howard and Jordan on a tour of the building before the OR is cleaned and sterilized. Tomorrow the OR cleaning will take place as Jane and I will work on organizing our surgical supplies for each case so we can have a more efficient turnover between surgeries. When you have one operating room and several long surgeries on the schedule, the only efficiency is found in the turnover process. If we can decrease turnover time, we can accomplish a big schedule in a day. I remember in past times I was here that we operated sometimes from 7 am to almost midnight each day because of the time involved in between cases. Then we did not have a recovery room so the patient recovered on the OR table for a while before being transferred to the post-op bed. Then the room had to be cleaned and made ready for another surgery. Often we had an hour or more between cases just trying to turnover the room. Now we have a separate recovery room so the patient can be move there and still stay under our direct supervision as we prepare the room for another surgery. This allows us to move along efficiently even when we have four surgeries that will likely take two hours each to perform. Jane is doing the lump and bump surgeries under local and I am standing by to be a circulator, the one who gets the needed supplies for the surgeon. The surgeon has on sterile gloves and gowns and can’t just go to the supply areas to pick up something. The circulator does that and then opens the packs and hands the needed supply to the surgeon using sterile technique so that the item is not contaminated by my ungloved hand. One nice benefit is the OR is air conditioned and it is quite comfortable in here. Air conditioning is needed in the OR to help pull out the humidity and keep condensation from forming on things like the lights and ceiling and walls. The last thing you need in surgery is some unsterile object or drop of water to fall into the incision. That unsterile drop could also be sweat from the surgeon’s forehead or mask as well. Sterility is vital in the OR to help prevent infection. Jane has a picture hanging on the wall in the OR that means so much to me. 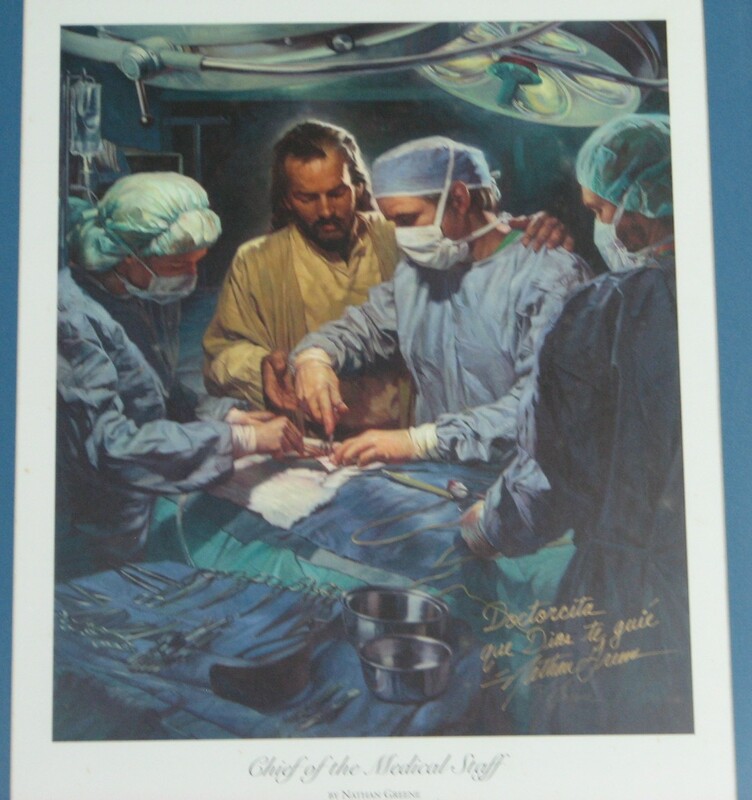 It is a picture produced by artist Nathan Greene and is titled Chief of the Medical Staff. It shows what we experience working here. Even though He may be invisible to our eyes, we know and feel His presence with us as we operate. I know He is standing with us much like the picture depicts and at times He wraps His hands around ours and guides us as we do surgery. I love this picture and I find it so meaningful to me. This is the only operating room I have been in that has this picture on display. It is a good reminder of why we are here and Who we are really serving. Jane finished the three local anesthesia cases. The fourth one did not come in. She removed some skin tags and moles, a breast mass and a lipoma. We then broke for lunch. Howard and Jordan were at a break time also and now have gone back to preparing another bucket of cement to put down another set of tile. This afternoon is more of a down time for me. We are done with any surgical work and there is nothing on the schedule relating to any patients to be seen. The tile project is moving along nicely. Howard and Jordan have about 75% of the floor covered and will finish tomorrow. Then grout will go down and once that is dry the wall tiles will start going up. I noticed Jordan had many mosquito bites on his arms and legs. His arms were covered with welts from the bites. I asked Jane about mosquito netting and she said there were nets in the house and told me where to find them. We found them and Jordan and I strung up nets over his bed and mine. Plus we found another fan that Jordan can have as his personal fan to keep a breeze blowing on him all night. He is happy and should sleep better without mosquitos bothering him. I am looking forward to the same. Tonight we went into town to eat at a restaurant at a hotel. The matron of the hotel is a patient of Jane’s and I think I helped with her surgery in the past. We have eaten there before when I have been here. The food was really good tonight and this time Howard was saying it was the best meal ever. We had a good time and then came back to the clinic to call it a night. Hopefully the mosquitoes will be kept away from Jordan tonight. Father, thank You for a good day. We are getting a lot done, especially Howard and Jordan on the tiling. This will be so helpful to Jane to have this building ready for use. Thank You, Lord, for bringing us here at this time so this work could be done. Lord, I pray for Jordan and all the mosquito bites. Help him stay comfortable as I know they itch a lot. Thank You for bringing Jordan here with us. He has been a great help for Howard and for Jane. Father, I pray for a good night’s sleep and a productive day tomorrow as we get the operating rooms prepared for surgery on Saturday. We have a busy schedule ahead of us and we will need Your help. Thank You for being here with us and giving us the strength and stamina to do this work of service. Lord, I praise You for Your unfailing, unconditional love. Thank You, Father. Amen.